If you’ve ever glanced at a map in your life, you’ll see Canada is a big place. Stretching 7,800kms from coast to coast (and we have a third coast too! ), we’ve got a lot of landscape all fit into this beautiful country of ours. Each one is unique in its own way, allowing cultures to grow around the landscape. In the Canadian Maritimes, it’s no different. The Maritimes, or Canada’s east coast, has developed its own way of life, and if you visit, you’ll see that it’s a vibrant and hardy way to live. In this epic Canadian Maritimes road trip itinerary, I’ll focus on New Brunswick, Prince Edward Island, and Nova Scotia. I should note, again, Canada is a FREAKING LARGE country. Coming from Toronto, we stretched the road trip for 10 days, but there is so much more to see and do in each region. I’ve said it twice, so why not a third time, Canada is significant. Not only does this have a role in the amount of time you have to explore, but also you should also take it into account when planning your trip. There are stretches of roadways that don’t have gas stations, rest stops or places to find food. And there are places along the way that you may lose cell phone signal. On the flip side, there will be many picture-perfect stops to pull over and have a pit stop picnic. Tip one: bring along a cooler to keep some fresh food cold. It will be a nice change to make a fresh sandwich or bite into a crisp apple rather than buy junk from a gas station. Tip two: keep any roadside assistance numbers handy, written down in the front console or glove box. You never know if your phone will run out of juice when you need it. Tip three: if you get below half a tank of gas, plan to see how far until the next gas station. Not only will this give you relief, but running out of gas is the worst. I once chugged into a Manitoba gas station with a “9 km” gas range left on my car – basically fumes. It caused a lot of anxiety not knowing where the next station was and if we were even going to make it. Tip Four: have a good selection of music, podcasts, audiobooks or whatever suits your ears. As I mentioned above, cell signal disappears in parts of the Canadian Maritimes, so you won’t have access to streaming services, and even radio stations are silent. Now onto the fun stuff. Here are the best stops for an epic road trip through the Canadian Maritimes. New Brunswick is the only officially bilingual province in Canada, and its landscape blew me away. It is a very underrated province, but there is more and more available for visitors to sink their teeth into. The province has embraced its Acadian heritage and the fact that it is situated on two of the most incredible waterways – Gulf of the Saint Lawrence and Bay of Fundy – definitely helps its cause. New Brunswick isn’t a large province, especially in comparison to its neighbor Quebec, but it has a range of landscapes like the northern edge of the Appalachian Mountains, the rugged and hardy coastline of the Bay of Fundy, and the fertile arable land of the east. There are many treasures to discover here. Try saying Kouchibouguac five time fast. While you may not be able to pronounce this place correctly, you’re sure to enjoy its soft white sand. 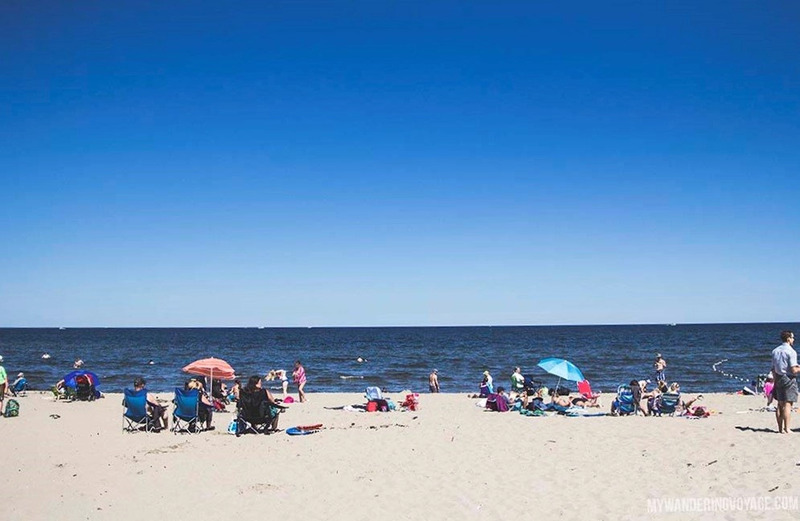 The national park is situated along New Brunswick’s eastern Acadian Coast and is home to a range of ecosystems, including a beautiful beach ready for lounging. If the quaint name doesn’t make you want to jet set all the way here, then the charming village will. It was voted top destination in Canada in 2017 by USA Today and has ranked high in many top 10 lists. Saint Andrews by the Sea is not only a picturesque town but a jumping off point for many whale watching and scuba diving tours. The best way to experience the town is to sit in one of the many restaurants along the water and feast in local, fresh-caught seafood. Not to be confused with St. John’s, Newfoundland, Saint John is Canada’s oldest incorporated city. It’s situated strategically in the Bay of Fundy, and Saint John has become a place that soldiers mustered many times over the history of the New World. It’s full of rich Canadian and American history, as many loyalists fled to this city during the American Revolution. The history means there are many old buildings to discover. 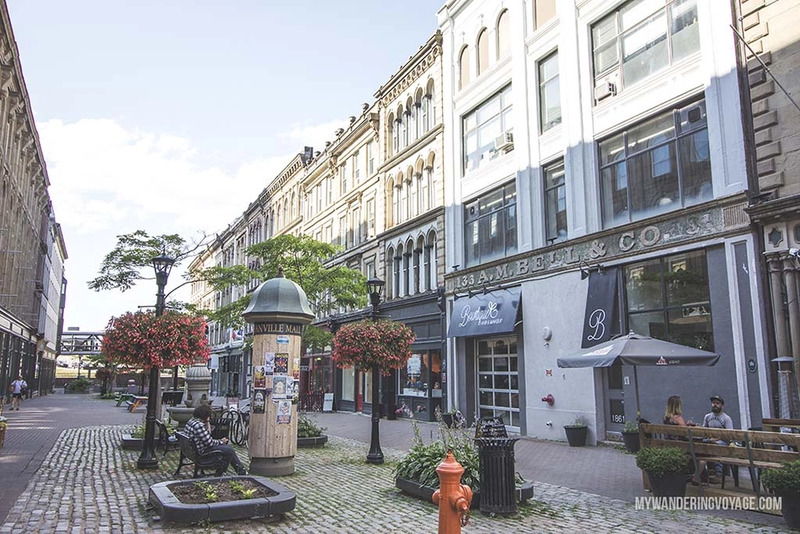 Walk through the loyalist cemetery, become a soldier at Carleton Martello Tower and enjoy fresh finds at Saint John city market, the oldest continuing farmers’ market in Canada. Fundy National Park is the crown jewel of New Brunswick. 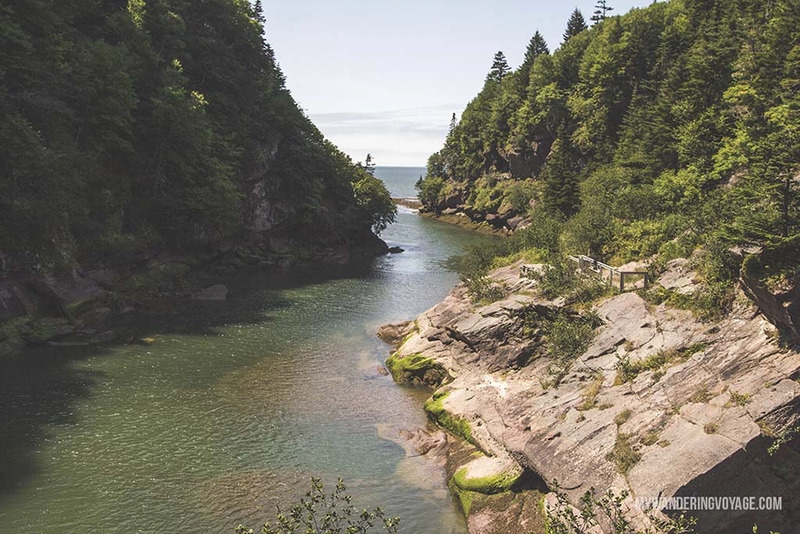 Here you can experience some of Canada’s largest tides in the Bay of Fundy or go inland to see the thick forests. New Brunswick is known for its covered bridges, so Fundy National Park is the perfect spot to find some Instagram-worthy locations. It’s also a great place to get out and take a hike. There are plenty of waterfalls within the park and trails ranging from easy to demanding lead to these amazing places. The more accessible one is Dickson Falls Trail – a moderate 1.5-kilometre loop that takes you to the most photographed waterfall in the park. If you’ve ever wanted to walk on the ocean floor, then this is the place to do it. The Bay of Fundy sees the world’s largest tides, measuring a difference of 15 feet. Hopewell Rocks are rock formations that have been etched away by the tide. During low tide, you can walk along the ocean floor and explore a world beneath the water. During high tide, you can rent a kayak and take in the formations from above. 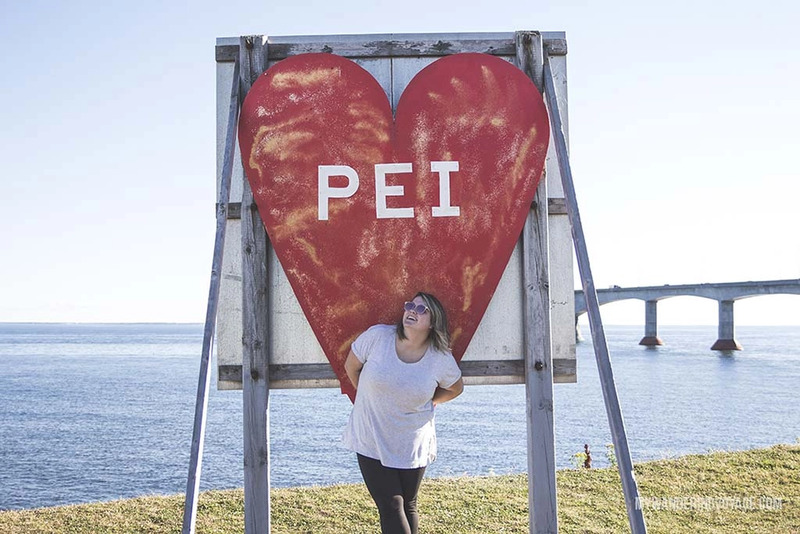 There’s no doubt that Prince Edward Island – known as PEI for short – is an iconic Canadian location. This little island province is known for its red sandy beaches, delicious seafood, and its relaxed way of life. Prince Edward Island is the birthplace of Canada, although the province didn’t join confederation until a few years after its independence. Until the 90s, PEI was only accessible by ferry or plane. Then engineers decided to build the longest (13 kilometers) bridge that spans over ice-covered water, connecting PEI to the mainland. When in PEI, remember to live on island time and take it easy, because there’s so much to explore! 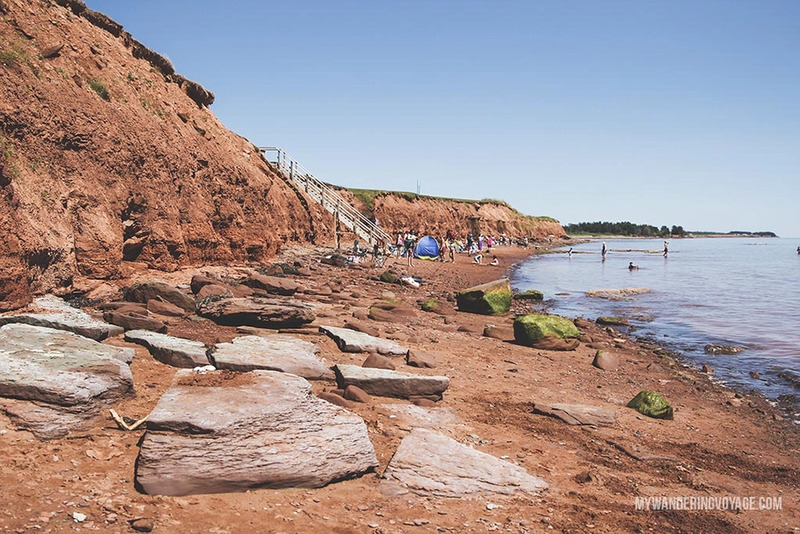 If you want to experience the red shores that makes PEI famous, then Argyle Provincial Park is just for you. The day use park is located along the red sands shore drive, about 30 minutes from Charlottetown. You can also walk along the ocean floor here when the tide is low. There’s no better place to enjoy a tasty treat on a warm summer day than Cows Creamery. There are many locations around PEI (and the Maritimes), but the origins of all that delicious ice cream come from Cows Creamery in Charlottetown, PEI. You can take a factory tour to see how their ice cream, butter, and cheese are made. All their ice cream is made with local milk and high-quality ingredients. Go hyper-local and get yourself the PEI strawberry – you won’t be disappointed. The capital city of PEI, Charlottetown, isn’t very large in terms of city size, but it offers so much history. Explore the Province House National Historic Site, where the idea of Canada was formed, take a stroll in the beautiful Victoria Row, enjoy the sunshine at one of Charlottetown’s many waterfront parks, and take a dive into some delicious fresh seafood. During the summer months, the Chip Shack in Charlottetown is the place to go for a delicious lobster roll and local Cavendish potatoes. PEI is known for its potatoes that are grown right in the hardy red soil that covers the province. Not only is Prince Edward Island National Park a beautiful place to take a hike or enjoy a beach, but you can camp right on the shore. At the Cavendish campground you can wake up with stunning ocean views, and it’s a perfect way to spend your nights. Don’t forget to take in the towering sand dunes and red cliffs that make up this park. Look for the red and white lighthouses that dot the northern landscape. Anne of Green Gables is an iconic Canadian literary tale from the early 1900s. The author, Lucy Maud Montgomery, grew up on the island and created a beautiful story about her experiences. Today, you can explore Montgomery’s home and the Green Gables, which is a national historic site. You can even find Anne herself wandering through the little farm. Nova Scotia has a lot going for it. Not only does it have an incredible landscape, but it also has an incredible food scene. It’s rich in cultural history and has so many places to explore on an epic road trip of the Canadian Maritimes. In Nova Scotia, Halifax especially, you’ll notice many places that pay homage to the past – like Pier 21, where thousands of immigrants landed for the first time in a new country, or the Titanic museum – where you can learn about the incredible story of the Titanic, or Grand Pre – a UNESCO World Heritage site that shed light on the diaspora of the Acadians. In Nova Scotia, you’ll find it all, including the heart and soul of the Canadian Maritimes. It takes a particular person to be able to live and survive in the Canadian Maritimes, and Nova Scotians are a hardy bunch. Here are some places to explore in this Canadian province. There’s no doubt that Halifax is a stunning coastal city. From its delicious eats to waterfront and buildings, there is so much to see and do in the city. Since you’re on an epic road trip of the Canadian Maritimes, it’s time to park your car and stretch your legs. In the city, you need to check out the masterpiece that is the Halifax Public Gardens, the historical citadel that protects the city, the historic properties along the harbor, the lively waterfront, and, of course, the Alexander Keith’s brewery, which opened over 200 years ago. It’s easy to see why thousands of tourists flock to Peggy’s Cove each year. The lighthouse is one of the most famous in Canada and the town surrounding it is equally as impressive. Peggy’s Cove has a striking landscape that has been worn rough by the wind and sea. It can also be very dangerous. You’ll see many signs here warning people away from the shore. One sign reads “Injury and death have rewarded careless sight-seers here. The ocean and rocks are treacherous. Savor the sea from a distance. 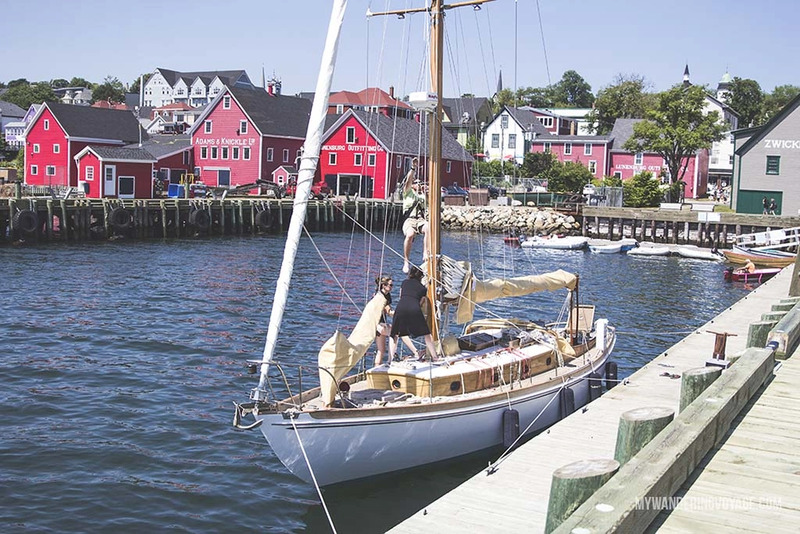 Lunenburg, Nova Scotia is a quintessential Canadian Maritimes experience. The old town was built around fishing and sailing. It is also the home of another Canadian icon – The Bluenose II. Due to its colorful architecture and historic settlement, the town is listed as a UNESCO World Heritage Site. Another UNESCO World Heritage Site is Grand Pre, a monument to the Acadian people who settled here and were eventually deported in the 18th century. The Acadians settled in the area, using dykes and sluice systems to farm the land. But a war between the French and English meant the New World was up for grabs. Thousands of Acadians were deported, and many died. Grand Pre tells their story. Whether you want to see the cities, the history, the ocean or the landscape, the Canadian Maritimes has it all. From the red soil island of PEI to the historic Nova Scotia, to the breathtaking New Brunswick, you’ll find yourself wishing to stay here forever. Olivia Rutt is a travel writer and photographer. She operates My Wandering Voyage, a travel website helping travel dreamers become travel doers while working full-time. 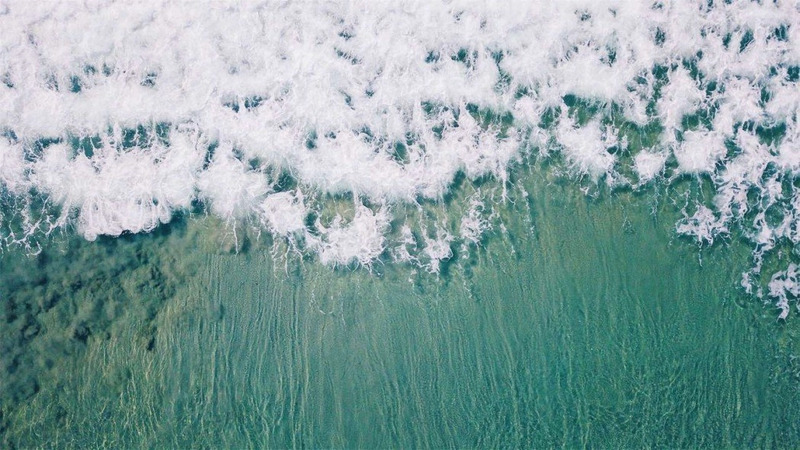 She shares her favorite photos, travel stories, and tips. Olivia hails from rural Ontario, Canada where she works as a journalist between travels.